Kailua is located on Oahu's east or "windward" shore and is home to two spectacular beaches as well as a lovely town with nice places to eat and shop. Kailua Beach and nearby Lanikai Beach are two of the finest beaches in Hawaii offering clear blue waters lined with white sand and typically enjoying calm conditions and pleasant onshore tropical trade winds. Kailua Beach Park is an excellent place for ocean activities including swimming, bodyboarding, kayaking, surfing and more. Join a guided kayak tour to paddle out to one of the offshore islands, go snorkeling or take a surfing or stand up paddle boarding lesson from a local. Kailua is also quite bike friendly with miles of bike paths along the beach as well as in wetland areas where you can see native waterbirds. Mountain bikers will enjoy the Maunwaili bike trail at the base of the Koolau mountains which is popular for its stunning scenery and lush rainforest areas along a 20-mile route. A relatively easy yet rewarding hike in this area is the Kaiwa Ridge Trail leading up to the "pillboxes" which were shelter bunkers for soldiers guarding the area during World War II. This hike provides great views of Lanikai Beach, Kailua and the Mokulua Islands offshore. A more strenuous hike ascends Mount Olomana providing sweeping views of the windward coast. Another fun hike is the Maunawili Falls trail which leads to a nice waterfall and swimming hole. At Kawai Nui Marsh you can walk a path through wetlands to see native Hawaiian birds in their natural habitat. Golfers can choose from several exceptional courses on Oahu's windward side, all with impressive views of the Koolau mountain range. 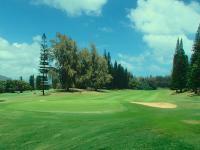 The scenic Koolau Golf Club is one of Hawaii's toughest courses, and the Olomana Golf Course is considered President Obama's favorite course with great views and memorable signature holes. The municipal Pali Golf Course extends along the foothills of the Koolau range with stunning mountain vistas as well as views of Kaneohe Bay. Kailua Beach and Lanikai Beach are noteworthy for their pleasant atmosphere, scenic beauty and plentiful water activities. Kailua Beach Park has full facilities including restrooms and showers as well as lifeguards. Kailua Bay and Lanikai Beach are both fairly well-protected from the open ocean creating ideal conditions for swimming, snorkeling and other water sports. Lanikai Beach is the quintessential tropical beach with pure white sand and water that seems at times translucent. There are no facilities or lifeguards at Lanikai Beach though it's still worth a visit for the sheer beauty. More exceptional beaches can be found to the south in Waimanalo and all along the northern shore. A variety of restaurants in the Kailua area appeal to all tastes from Indian and Italian to Thai, Sushi, steakhouses and Pacific Rim Cuisine as well as Hawaii Regional Cuisine. 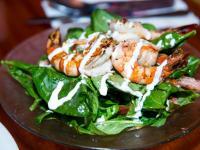 Many restaurants offer plate lunches perfect for enjoying a day at the beach. For a tropical ambiance and a hearty lunch or dinner try the local landmark Buzz's Original Steakhouse located just steps from Kailua Beach. In business for more than 50 years, Buzz's decor includes a koa wood bar, surf pictures on the wall and great food making this a nice place to enjoy fresh seafood or a delicious prime rib. Fresh island vegetables and fruits can be found at the Kailua Town Farmers Market every Sunday from 9 am to 1 pm. Listen to live music and taste a variety of local creations including fresh-baked pastries. Kailua's town center is only about a half mile long but what it lacks in size it makes up for in selection and charm. Boutiques offer everything from fine jewelry and antiques to island-inspired art and clothing. 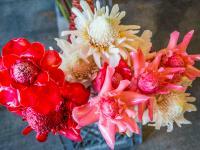 Grocery and health food stores, pharmacies and department stores can all be found in Kailua. A rental car is recommended when visiting Kailua so you can visit the area's beaches and attractions as well as other sites around Oahu from north shore beaches to Waikiki on the southern shore. Public transportation is provided by "TheBus" and taxis are also available. Kailua weather ranges from about 70 to 85 degrees F throughout the year with rain and wind conditions varying in different areas throughout the seasons. The north and eastern shores of Oahu are generally a bit wetter and cooler than the south and west shores, and the winter months typically see more rain than summer. Hawaii's predominant trade winds blow from the northeast bringing moisture-laden clouds that typically rain onto the mountains of the windward and north shores creating verdant, tropical landscapes. Ocean conditions vary each day though typically Kailua Bay will have the calmest waters during the summer. The beaches of Kailua are relatively well protected from the open ocean making them good for swimming and ocean activities on most days. To enjoy the ocean safely it is always best to visit lifeguarded beaches like Kailua Beach Park, obey all posted warnings and check with the lifeguards about the conditions on that day for the activity you choose. 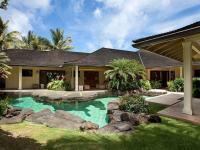 Kailua vacation rentals provide the optimal way to enjoy your Hawaii vacation with all the luxuries of resort living and the comforts of home including nearby shopping, dining and entertainment. Browse through our Kailua vacation rental listings to get an understanding of the different amenities and property features we offer. 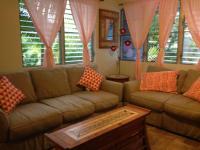 Our goal is to provide you with a with an unforgettable Kailua accommodation for your dream Hawaii vacation. We take pride not just in having the largest selection of high-quality vacation rentals in Kailua, but also in the fact that we stand behind our product and make sure only the best of the best Kailua properties are listed on our site. If you have questions about our Kailua rentals or which destination is best for your vacation needs, please give us a call and we will be happy to assist you. Kailua's human history began about 500 AD., according to Bishop Museum research, and in 1795 the rising Hawaiian warrior Kamehameha conquered Oahu and then gave the Kailua region to his chiefs and warriors who helped in the conquest. Kailua has a history of agriculture beginning with taro and other Hawaiian crops, and then later sugarcane and rice before becoming a major cattle raising region. In the 1940s Kailua was still a very small town of about 3,000 people but changed rapidly due to World War II and military bases spawning development. In the 1950s a tunnel through the Koolau mountain range quickened the trip from the south shore, and Kailua soon became a bedroom community of Honolulu with thousands of workers making the commute each day. By 1960 Kailua had grown to about 25,000 people and is about double that number today.